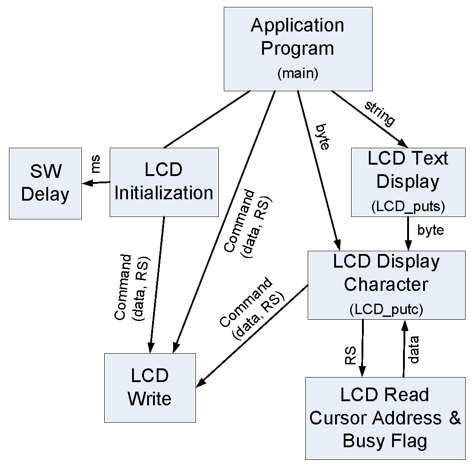 Implement LCD control using bit-banging I/O techniques. How to implement a bi-directional parallel IO interface. Microprocessors are the core element in an embedded system. Most embedded applications need resources or capability not available in the microprocessor. The additional capability can be provided by specialty electronic devices. Computer communications is necessary to exchange data between the microprocessor and these devices. The communications interface is provided using serial or parallel inputs and outputs. Parallel I/O implies multiple input/output operations at the same time whereas serial I/O implies single bit data exchanges. Whether the communications interface is serial or parallel, handshaking is required to coordinate the data exchange activity. Develop and test a collection functions that allow text to be placed at any position on a parallel I/O character LCD following the DFD and CFD models presented in Unit 3. The LCD_puts function is required to process the ASCII control characters, which are described in Table 8.1. All LCD interface pin control will use LATx, LATxSET, or LATxCLR instructions for outputs and PORTxBITS for inputs. 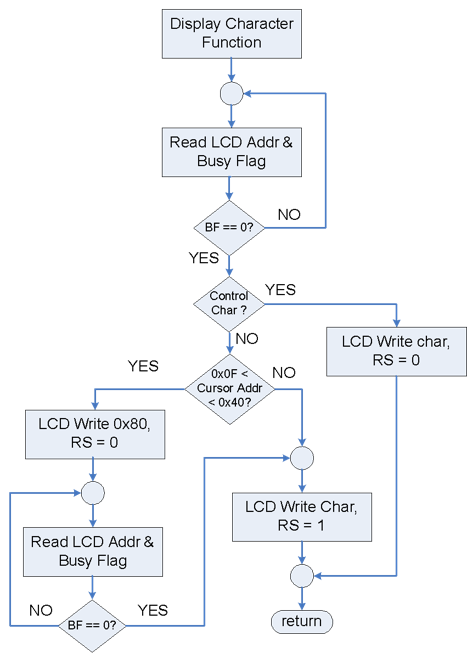 Initialize the LCD using the recommended sequence of instructions shown in the control flow diagram FIg. B.2. 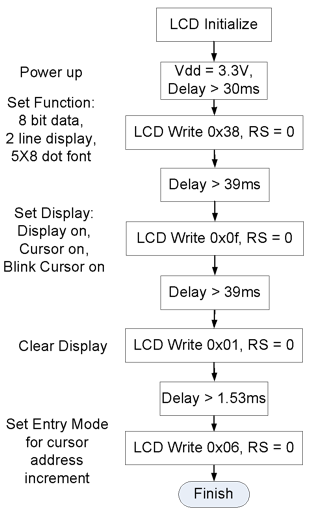 to write specific codes to the LCD at specified intervals. Translate the ASCII control characters into one or more C instructions for the LCD, as detailed in Table 8.1. Copy the software delay function from Unit 2, Listing 3 to swdelay.c. How can the blocking semaphore represented by the Busy Flag be eliminated?